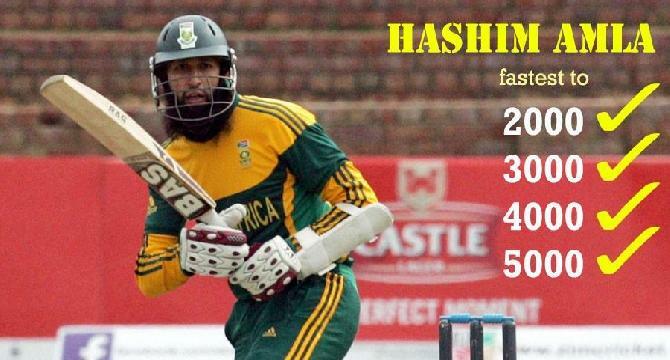 Hashim Amla, The legend of this Era ! South African Cricket team ODI vice-captain and Test captain Hashim Amla is one the amazing batsmen this century has ever produced. He breaks all the record of fastest ODI runs recently set by set by Indian vice-captain Virat Kohli. He first breaks the record of fastest 2000 runs in ODI then fastest 3000 runs then fastest 4000 runs and now he is the fastest batsmen to complete 5000 ODI runs in just 100 innings leaving behind Virat Kohli, Brain Lara, Sachin Tendulkar and many others. He has 18 hundreds and 27 fifties with an average score of 55.59. His best score in ODI is 153 (not out). He is the legend of this era and youngsters should have to learn much more from this type of players.